The name Wedgwood is probably the best known, and most highly respected, in the history of English ceramics. The company was established in 1759 by Josiah Wedgwood I, who set a precedent of excellence in ceramic technique, design, and marketing. For the majority of its long existence, the company remained in the Wedgwood family. In the mid-19th century, the business based at the Etruria Works was continued by Francis Wedgwood, grandson of Josiah I, and he was joined by his three sons during the 1860s. The eldest son, Godfrey Wedgwood, who served as art director for most of his tenure, was chiefly responsible for the revival which the Wedgwood company experienced in the 1860s, as attention was increasingly turned toward the development of new and innovative products and higher standards of manufacture and design. Josiah Wedgwood I, founder of Josiah Wedgwood & Sons, Ltd., was born on July 12, 1730 in the famous pottery district of Staffordshire, England. The Wedgwoods had been potters for four generations, but the industry at that time was little more than a craft, producing clunky, utilitarian wares with little financial reward. Up to the early 18th century, it was only the wealthy class who owned dinner or tea sets, and these were usually made of silver or imported Oriental porcelain. The poorer classes used "treanchers"- made of wood, pewter, or a very crude form of pottery. Wedgwood set to work to take advantage of a waiting market. In 1754, Wedgwood joined Thomas Whieldon of Fenton Low, then considered the most skillful potter in Staffordshire. Whieldon was chiefly concerned in the manufacture of cheap white stoneware and earthenware in variegated colours called tortoise shell [1992.B.228, 1992.B.229] that were typical of the time. This association with Whieldon bolstered Wedgwood's education in the business of pottery production, and he eventually became a manufacturer in his own right. In 1759, he leased the Ivy House Works in Burslem from his cousins John and Thomas Wedgwood. Here, experiments in Cream Color Ware (or "Queen's Ware," as it was later called) evolved to a more sophisticated form. Queen Charlotte (1744-1818) herself ordered a set of cream-colored earthenware, and Wedgwood was granted permission to call himself 'Potter to Her Majesty,' as well as refer to his innovative creamware as 'Queen's Ware.' In 1762 he met his prospective partner and close friend, Thomas Bentley. He entered into a partnership with Bentley in 1768, which was only ended by the death of Bentley in 1780. In 1764, he transferred his business and leased the Brick House (subsequently named the Bell Works) in Burslem, and in 1766 Wedgwood acquired the Ridge House estate of 350 acres, where he constructed the Etruria Works. Opened on June 14th, 1769, Wedgwood named this second factory Etruria after the region in Italy where the pre-Roman, Etruscan culture flourished and where Greek vases, mistakenly believed to be Etruscan, were unearthed. Inspired by these discoveries and the discovery of Pompeii, Wedgood turned his attention to artistic pottery and the trend of the European revival of classical art, referred to as Neoclassicism. His neoclassical ceramic creations evoked the styles and themes of antiquity so popular in the late 18th century, and after Wedgwood himself threw the first six vases at Etruria, they were inscribed with the Latin legend, "Artes Etruriae Renascuntur," meaning, "the Arts of Etruria are Re-born." Jasperware, an unglazed vitreous fine colored stoneware that served as a vibrant backdrop to delicately applied white reliefs with classical themes, is perhaps the most well-known of Josiah Wedgwood's inventions, and first appeared in 1774. Although today best-known perhaps for this iconic light blue jasper nicknamed "Wedgwood Blue," Wedgwood's great success was largely due to the production of more utilitarian wares: plates, cups, saucers, and dishes cheap enough to be bought by people of modest means. Wedgood took an active part in the affairs of his country, devoting much time and money to the development and betterment of the district known as "The Potteries." He died January 3, 1795. Josiah Wedgwood’s sons John, Thomas and Josiah II (and nephew Thomas Byerley) were admitted to the partnership in 1790, and on Wedgwood’s death in 1795, management of the business passed to the remaining partners Josiah II and Thomas Byerley (John and Thomas Wedgwood left the partnership in 1793). In 1895, the business was incorporated as a private company, ‘Josiah Wedgwood and Sons Ltd’. The Barlaston Hall estate was purchased in 1937 and construction of a new factory and village commenced in 1938. Construction was halted by the war, but resumed in 1945 and the factory commenced full production in 1950. Josiah Wedgwood & Sons Ltd. became a public company in July 1940 as part of a restructure of the company’s share capital to fund the completion of the Barlaston factory. The capital raising of £350,000 in new one pound shares was subscribed by the existing family shareholders numbering approximately 150, and control of the company remained firmly in the hands of the Wedgwood family. It remained the company’s major manufacturing base in the United Kingdom until 2008. Etruria, home of the Wedgwood businesses for 180 years, was demolished in 1966. Today visitors can tour a Wedgwood museum and factory, at the World of Wedgwood located in Barlaston, Stoke-on-Trent, Staffordshire, England. Heather Bowling, Digital Collections Content Coordinator, 2017. Charles L. Venable, Ellen P. Denker, Katherine C. Grier, Stephen G. Harrison, China and Glass in America, 1880-1980: From Tabletop to TV Tray, (New York: Harry N. Abrams, Inc., 2000). Nicholas M. Dawes, Majolica, (New York: Crown Publishers, 1990), 93. 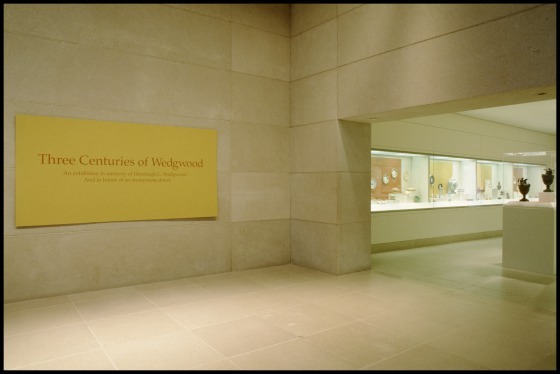 A large portion of the DMA's Wedgwood collection was donated by Barbara and Hensleigh Wedgwood. Barbara was a wedding gift buyer for Neiman Marcus when she met her husband-to-be, Hensleigh Wedgwood, president of the North American division of Josiah Wedgwood & Sons Ltd. He was a direct descendant of Josiah Wedgwood I.